A drone image looking out over Winchmore Research Station. Photo: AgResearch. 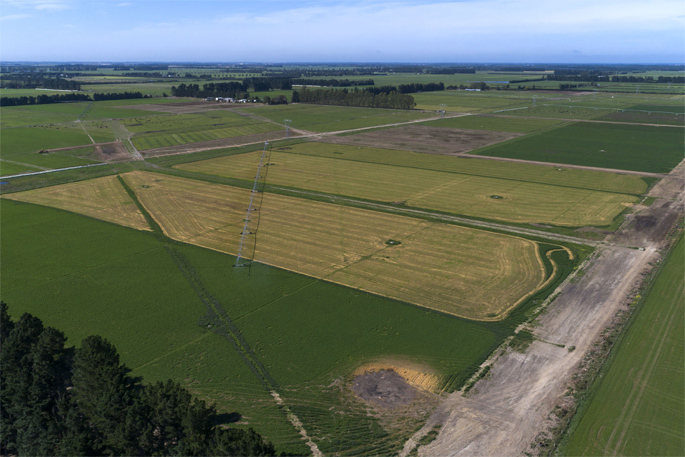 The site of New Zealand’s running fertiliser trials under pasture is now up for sale – but the farming community is being reassured the long-term trial will be continued. AgResearch, which has decided to sell, says the station northwest of Ashburton has been contributing to local and regional research for more than 72 years. The 4.1-ha fertiliser trial has been in place since the 1950s, and will continue operating beyond the sale of the farm. The Fertiliser Association of New Zealand has signed a 35-year lease with AgResearch to ensure the long-term fertiliser research trials at Winchmore continue. FANZ chief executive Vera Power says the site has been providing extremely useful information for almost 70 years now. Winchmore’s fertiliser trials complement the other long-term fertiliser trial, on North Island Hill Country, near the Manawatu Gorge. John says the combination of Lismore soils and spray irrigation at Winchmore will enable a wide range of future cropping and grazing options. Crops on farm this season include potatoes, wheat, barley, maize, peas and specialist seed crops, with a small area retained in lucerne and permanent pasture. Originally 308ha, the farm is being subdivided into two parcels, either side of the Dromore Methven Rd, with the larger parcel of approximately 247ha to be sold on the open market. The farm will be offered for sale by deadline private treaty, with offers to be received by the end of February if not sold prior. “The sale of Winchmore will enable AgResearch to invest in its wider research facilities, and thus continue driving prosperity by transforming agriculture,” says John.